InLoox PM is project management software, at least that is the use it was designed for. But some InLoox customers use it for other purposes than that, thanks to the versatility of InLoox. An example is VIGC in Belgium. VIGC, the knowledge center for the printing industry in Belgium, is a non-profit organization which is partly funded by the regional government. They were looking for a time registration system to be able to easily generate the reports the government requires. And that still is their primary use of InLoox PM: time registrations and reporting, not project management as such. And now they have even given a completely new dimension to InLoox: it has become an integral part of their quality management system, e.g. for registration of trainings and of complaints. VIGC recently had an audit of their ISO 9001 system and the auditor found some smaller errors. The auditor criticized that there wasn’t really a system for the registration of trainings and for complaints. In many cases, companies use an Excel sheet for that, but VIGC wasn’t convinced that that would work. A separate register for only those two cases would probably not be used in practice. So they looked at InLoox, which has become an essential part of their business. 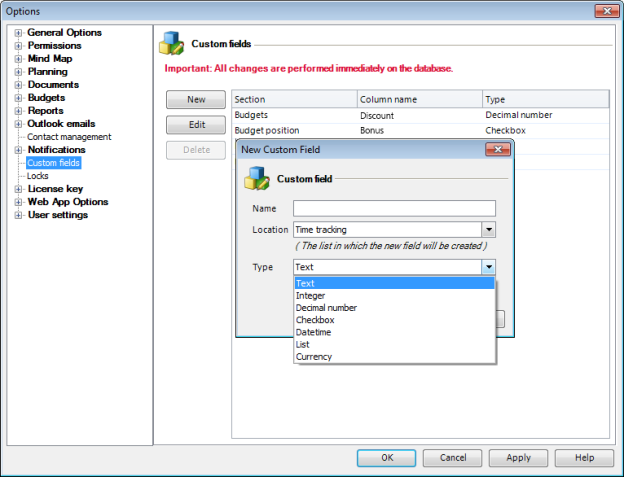 And the solution was quite easy: You can define custom fields in InLoox PM. So, they created two extra check boxes in the project section: _Complaint and _Training. They used the underscore so that the two items would always be at the top of the custom fields, making them immediately visible when a project is opened. Remember that VIGC is mainly using InLoox for time tracking, so for every activity, they create a separate project. If they for example send out a mailing to their members and somebody complains about it, they now can check the check box in the ‘mailing’ InLoox project. In the InLoox PM project list, it is very easy to filter by projects in which the _Complaint checkbox has been activated. A custom view was created, literally in a few seconds, and was shared with all people at VIGC. In the custom view the project name, the manager and the ‘first customer’ are immediately visible. And also part of the ‘note’ field is shown. The note field is used to register more information about a complaint e.g. Which actions were taken? How did it end? And that’s what the ISO 9001 auditor wanted: a traceable logging of complaints and of trainings. Thanks to the flexibility of InLoox it is really easy to adapt it to your own demands and, as VIGC shows, even use it for things it wasn’t designed for. Please click here to find more information on VIGC. InLoox beyond project management – A customer story - InLoox • Copyright 1999-2019 © InLoox, Inc. All rights reserved.